Humayun was the eldest son of Babur and he became the second emperor of Mughal Empire as the successor of his father.After a decade of his ruling, he was ousted by Sher Shah Suri. When Sher Shah died in 1545, his successors couldn't control Afghani tribes who helped Sher Shah to win over Humayun and Humayun was exiled to Iran. 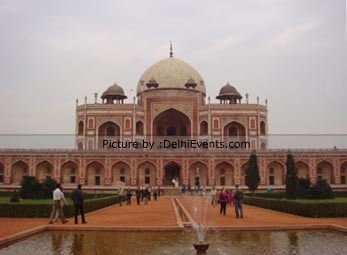 Humayun took the advantage of this situation and came back to Delhi in 1555 with his army. But Humayun died within few months of regaining his lost emperor as a result of falling down from the library at Sher Mandai. The Aga Khan Trust funded for the restoration of this monument which was completed in the year 2003 and because of that, the water started flowing in the fountains and water channels like it did before.